The Notre Dame University Mendoza College of Business Executive MBA (EMBA) is a part-time program offered in two formats: a 17-month program held in downtown Chicago, that meets every other weekend, and a 22-month program held at Notre Dame’s Stayer Center in South Bend, Indiana, where classes meet Thursday, Friday, and Saturday once a month. The Notre Dame Executive MBA curriculum includes coursework in management accounting, negotiations, and quantitative analysis, as well as a signature experience focused on executive integral leadership. Students are assigned a team of peers from different backgrounds to help promote a collaborative learning environment. Students enrolled in the Mendoza Executive MBA program enter with at least five years of professional work experience, although the average number of years in the work force among the class is 14. All students in the program are actively employed. Mendoza’s career coaches help students work with recruiters. All MBA students participate in the school’s Professional Development Program, which prepares them for future career opportunities. Students learn how to conduct more effective job searches by working on interviewing and networking skills, as well as their professional presence. The Notre Dame Career Catalyst helps students identify and obtain the career that best fits their skills. The Notre Dame Alumni Network gives students access to over 134,000 active alumni in over 40 countries. The Notre Dame Executive MBA tuition for students in the class of 2020 $129,000. This includes all tuition, educational materials, lodging, and class-day meals. 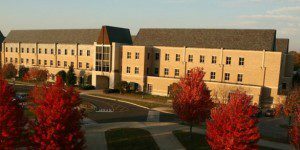 New EMBA students may be eligible for a John Cardinal O’Hara Society (JCOS) and J.A. Bernel Fellowship awards, which are based on merit and cover costs of $10,000 to $20,000. Fellowship applications are required. Prospective EMBA students are asked to submit official GMAT or GRE test scores or academic degree, academic transcripts from all prior institutions, and two letters of recommendation. An essay and slide presentation is also required with an application. The EMBA’s general application requirements also includes five or more years of work experience and active employment, a personal interview, and $100 application fee. In addition, international students may be required to submit official TOEFL, PTE, or IELTS academic score reports.